In the 1890's, a man by the name of Aron Streit and his wife, Nettie, left Europe and came to America. In 1916, Aron opened his first matzo factory. There, on Pitt Street on the Lower East Side, Aron and his first partner Rabbi Weinberger made all their matzo by hand. In 1925, Aron and one of his sons opened up a modern bakery in the same building on Rivington Street where Streit's stands today on the corner of Rivington and Suffolk. A few years later, Aron's other son joined the business. With the family working together, the Streit matzo bakery prospered and Aron bought three adjoining buildings to handle the growing business. They took over 148-154 Rivington Street. At the matzo bakery and at home, Aron and Nettie maintained the Old World traditions while building a life in the New World. Friday night Shabbos dinners were a ritual that continued throughout their lives. Although Aron died in 1937, his great-grandchildren carry on the family tradition, lighting Shabbos candles and teaching the fifth generation how to maintain jewish values in America. 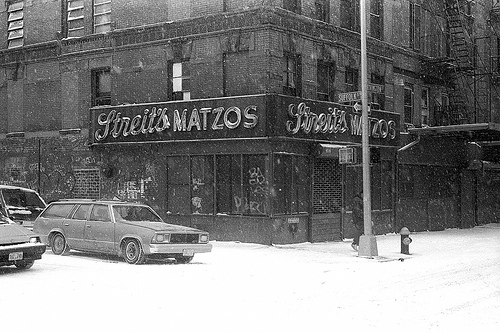 Streit's still occupies the same four buildings on Rivington Street where Aron and his sons started baking matzos more than 70 YEARS ago. And the matzo bakery is still a family business. Today, Aron's granddaughters and great-grandsons run the company. Streit's is the only family-owned and operated matzo company in America. While others have sold out to large corporations. One can still wander down Rivington and peer through levered windows to see rotating metal racks where they take wheat flour and water dough, roll it out cracker thin and bake until crisp. I did serious time as a bouncer for a bar across the street from Streit's factory. I spent many a cold winter night outside the bar, checking fake ID's, wishing I was inside the factory where it was warm and smelled like flour. The rotating racks would groan into the wee hours of my shift. Who knew matzo making was so nocturnal? On white hot summer nights when there was no relief from the dead thick humidity, the sounds of the conveyor belts would drive me insane begging for oil in a screaming cacophony of squeak and whir. The light and crispy song of machine-made matzo. Ossified tourists from the Midwest would oft stop and stare, mesmerised by the pendulum-like conveyor belts that spit out giant sheets of uncut matzo like baseball cards at Topps or money at the Mint in this nondescript Rivington storefront. They'd watch men effortlessly snap the fragile sheets into four to eight perforated pieces, breaking them off the side of giant stainless steel tables and then into shelves like they were sorting mail the week before Christmas, before they were placed into boxes. Inevitably, the fearless ossified tourists from the Midwest would muster the cute courage to ask if they could have a taste. And then they'd silently hand you a matzo or two through the bars on the window without taking their eyes off their work. And you'd go home, thinking you were special. It happened four or fives times a night. Anyway, what made me think of Streit's was The Daily News reporting that the Rivington Street property has been quietly on the market for the last few years, but now it's become public that the family is actively looking to sell its prime real estate for $25 million. Venti Peppermint White Chocolate Mocha, anyone?